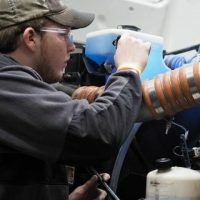 The shortage of diesel technicians has been getting plenty of attention lately and for good reason. Penske Leasing recently cited U.S. Bureau of Labor Statistics which reports that 67,000 technicians will be needed just to replace retiring workers by 2022. It will take another 75,000 new mechanics to meet the additional demand. A company called S/P2 maintains a database of resumes from tech students looking for full-time or part-time jobs or internships. According to, Kyle Holt, S/P2 president, of the students who have posted resumes so far, there are 12,000 interested in heavy-duty diesel maintenance, 30,000 interested in automotive repair, 12,000 interested in collision repair and 13,000 interested in a career in welding. Fleet Owner recently had the opportunity to visit with Kyle Holt. He has some unique insights into the technician shortage and what really happens when new technical school graduates enter the marketplace looking for their first jobs. Read the full article here. Copyright 2018 Informa. Used with permission.